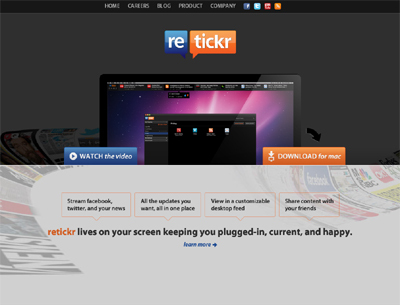 retickr is an application focused on personalizing and organizing your news. retickr creates a completely customizable stream of news RSS and social media in a ‘stock ticker’ format for easy viewing. Share instantly, stay productive, and always be in the know. Currently available in the Mac App store, retickr’s public beta is striving to innovate your news by personalizing it to you. Less noise. More news. retickr. Many services aggregate news. Aggregating sources is great, but if it is not personalized – then you are still drinking from a fire hose. retickr’s personlization algorithms will change that. Also, users want to share. retickr’s instant sharing allows a user to quickly send that hilarious blog post or incredible story with ease.